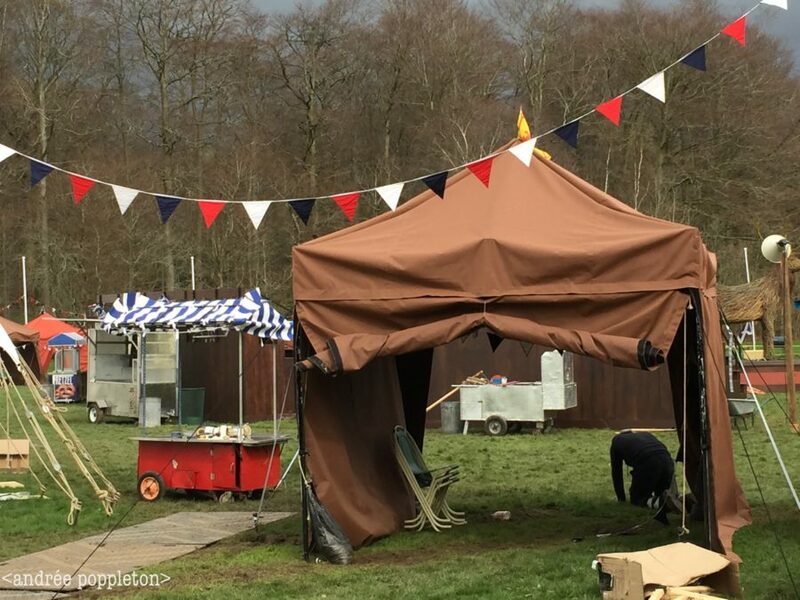 Outlander Episode 403, “The False Bride,” promised to be a roller coaster from the moment Outlander STARZ released that little trailer. 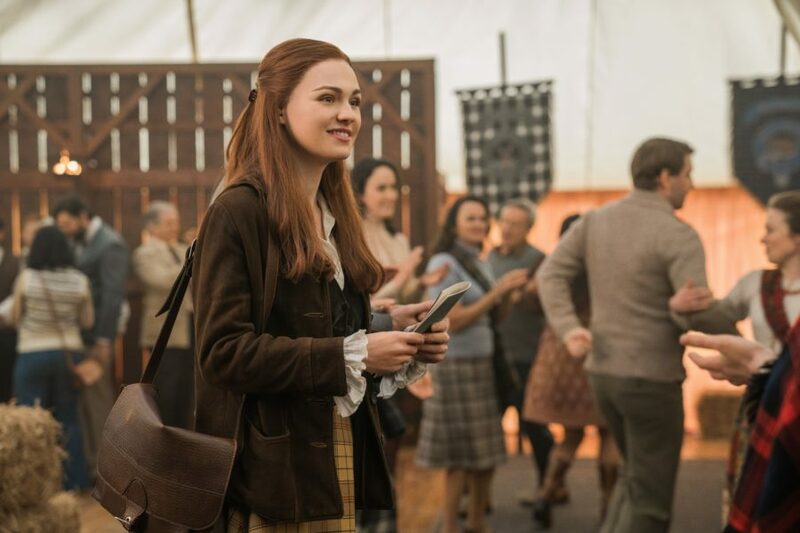 Not only would we see the Frasers heading for the hills, but we’d be transported back to the ’60s for some Bree and Roger action … and romance. 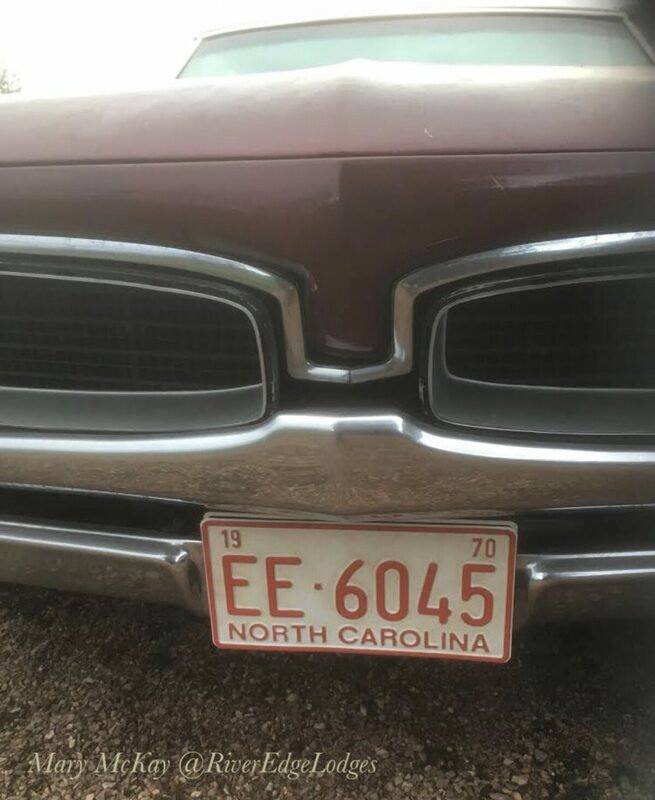 I have some good behind-the-scenes stuff for you in this post, both from my own experiences and from other fans, who again have been generous in sharing their stories and pictures with me. I’ll start in the order we see the locations in the episode. 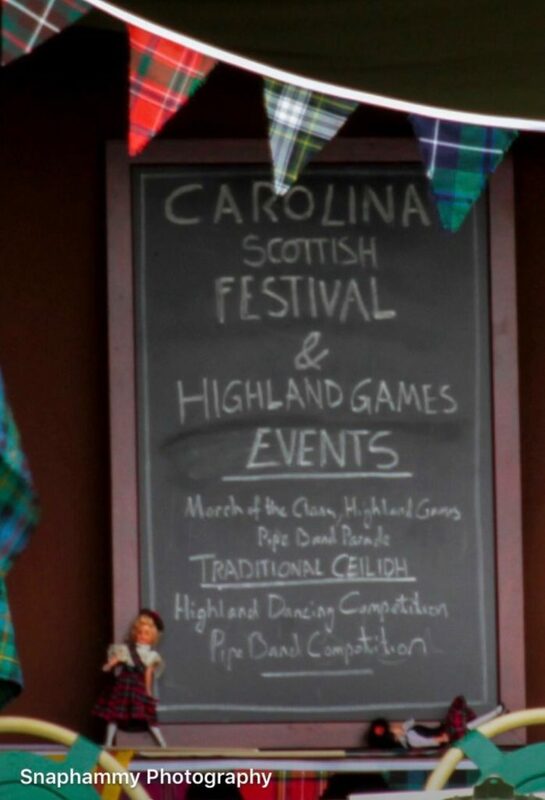 The Highland Festival in North Carolina in this episode was filmed in two locations. 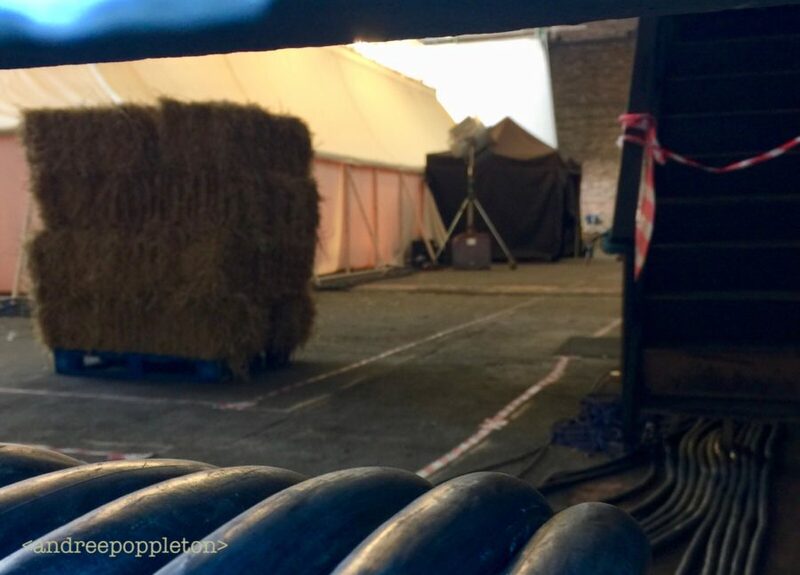 The first was a warehouse in Stepps, which is close to the Outlander studios in Cumbernauld. My friend Morag and I went there on a particularly bitterly cold day, without much spectator action. 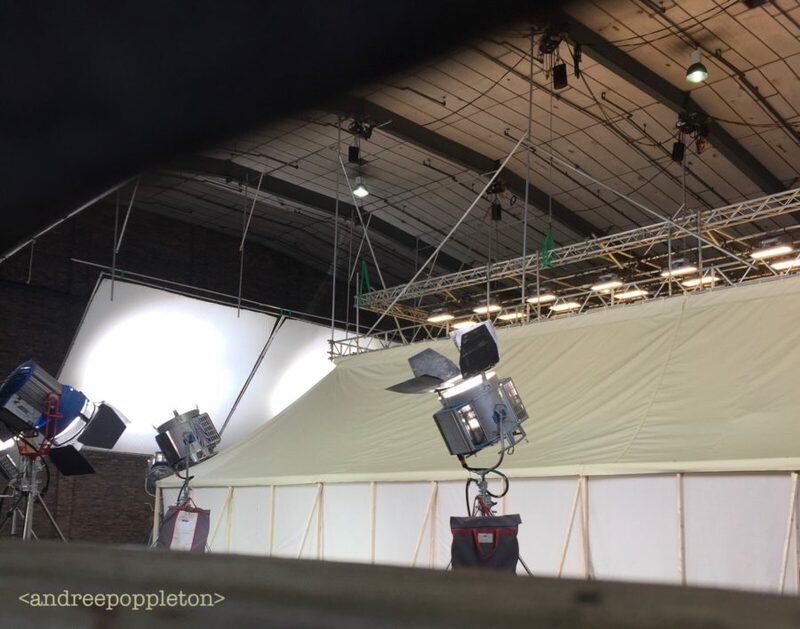 The interior of the warehouse had been transformed into a big tent and we caught a wee glimpse of the extras when they came out for a break. Other than that, it was a disappointing expedition. No sign of Sophie Skelton or Richard Rankin while we were there. This looks like where the indoor dancing scenes were filmed. 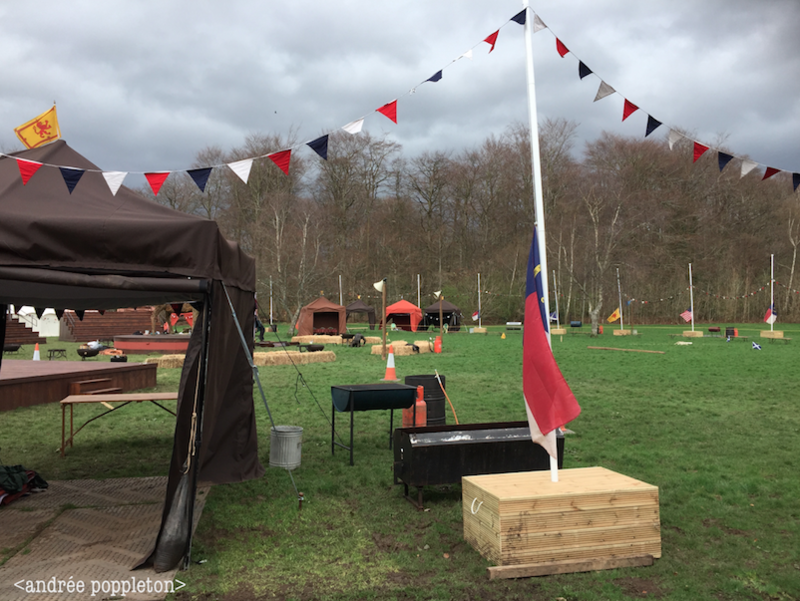 The second Highland Games location was Pollok Park just south of Glasgow. 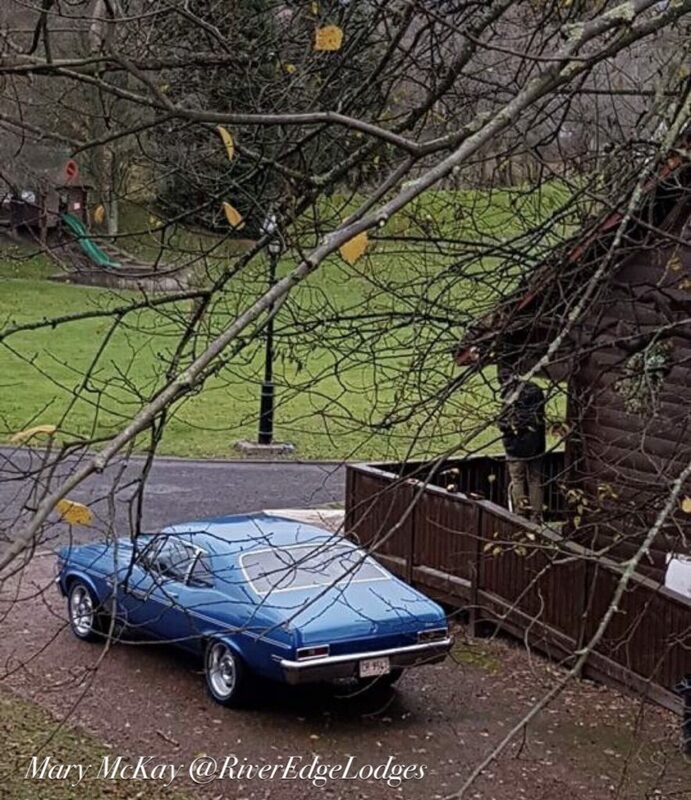 This park and the historic Pollok House are familiar locations to Outlander fans and have been used many times in filming so far. 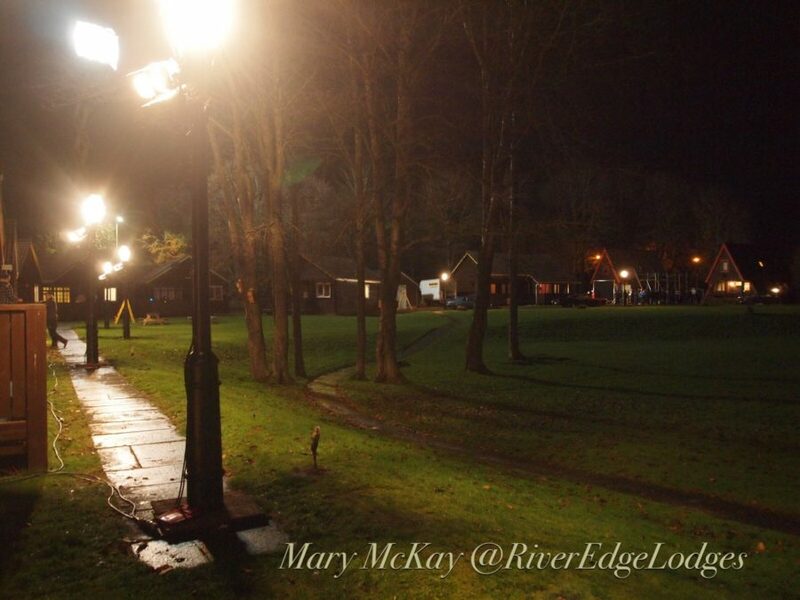 Think “Bois de Bologne” in Season 2 where the Jamie/BJR duel takes place and the bedrooms where Claire meets with Mary Hawkins after her assault. 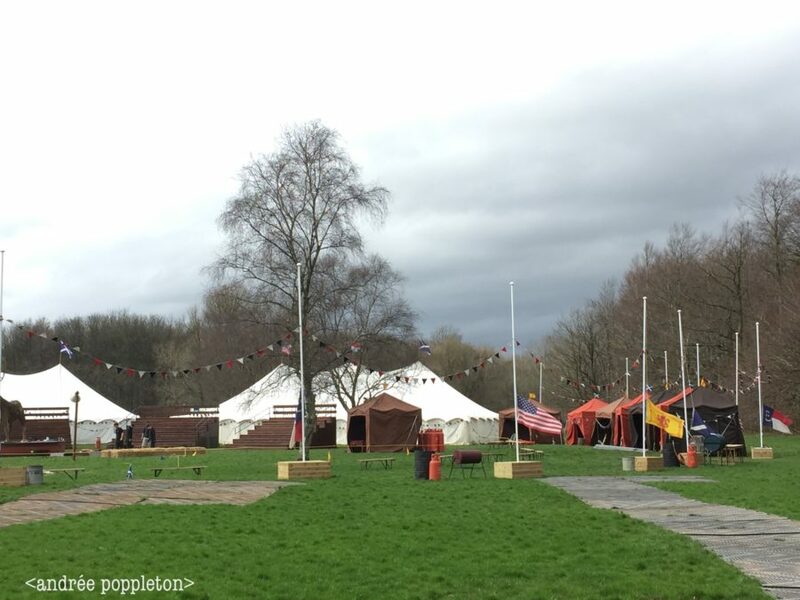 There was news that the sports field adjacent to Pollok House would be the scene for filming so I went there for a look during the day. There was indeed a lot of action with crew setting the scene. 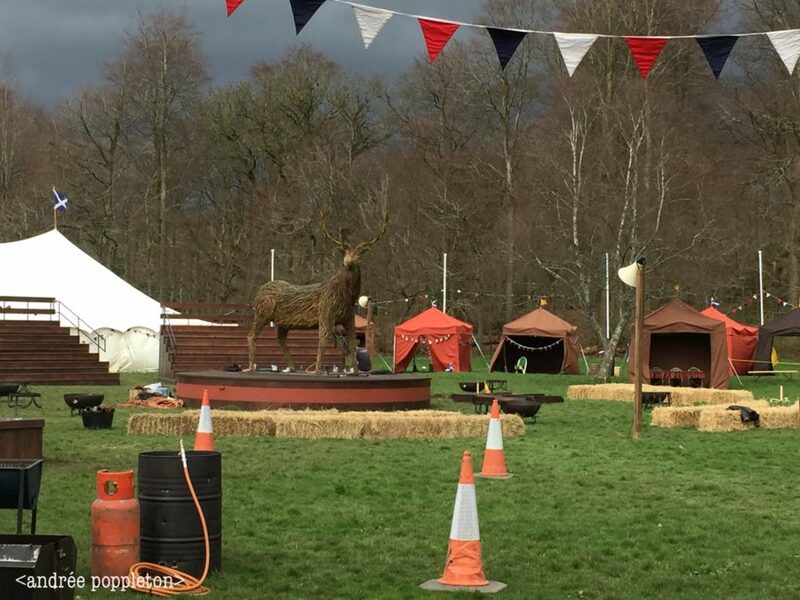 Here are some up-close pics of the arena, the stalls and the wicker stag that met a fiery end at the festival. I went back at night to maybe get a look at the night shoot, and saw hordes of extras arriving, but security was tight and I couldn’t get close for a look, so I decided to head off and missed the burning of the stag! 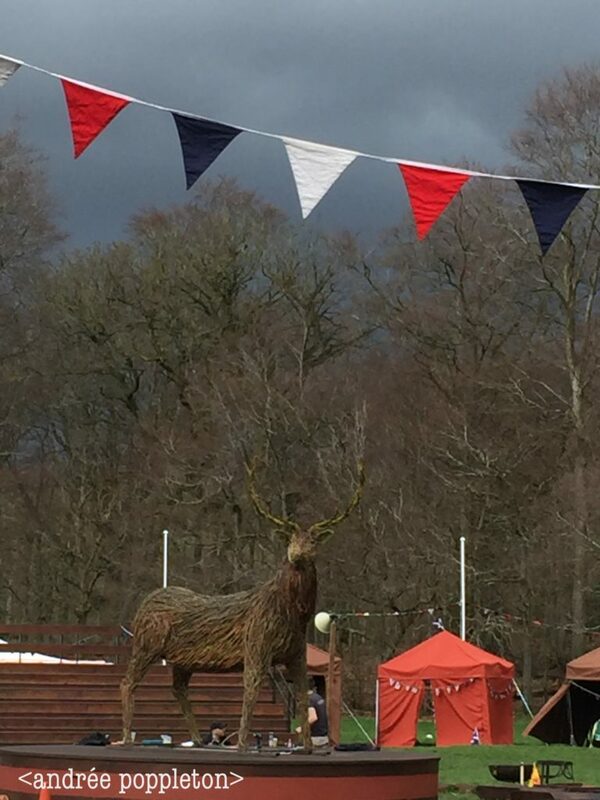 Interesting side note, the wicker stag was created by Sam Heughan’s uncle Trevor Leat, who is the artist of the Wickerman. 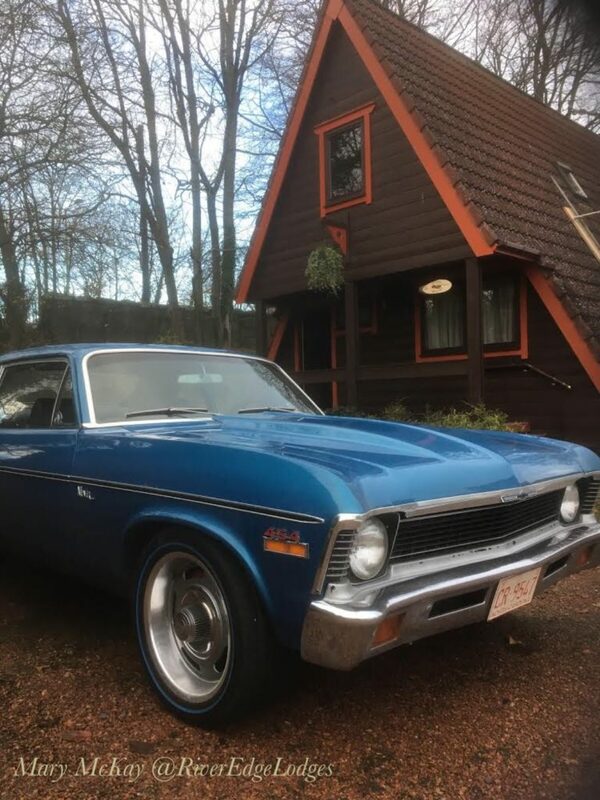 Here’s a little video, and you can sure see the family resemblance. 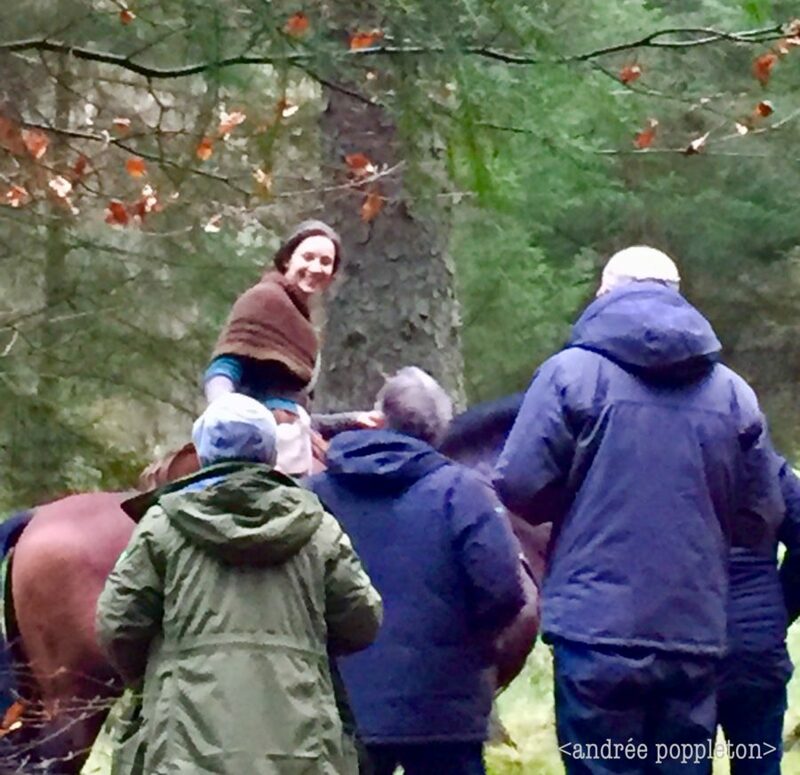 The scenes with Brianna and Roger at the cabins took me back to a chilly night in December 2017 when my fellow @newglasgowgirl Ren and I set off for an Outlandish adventure. 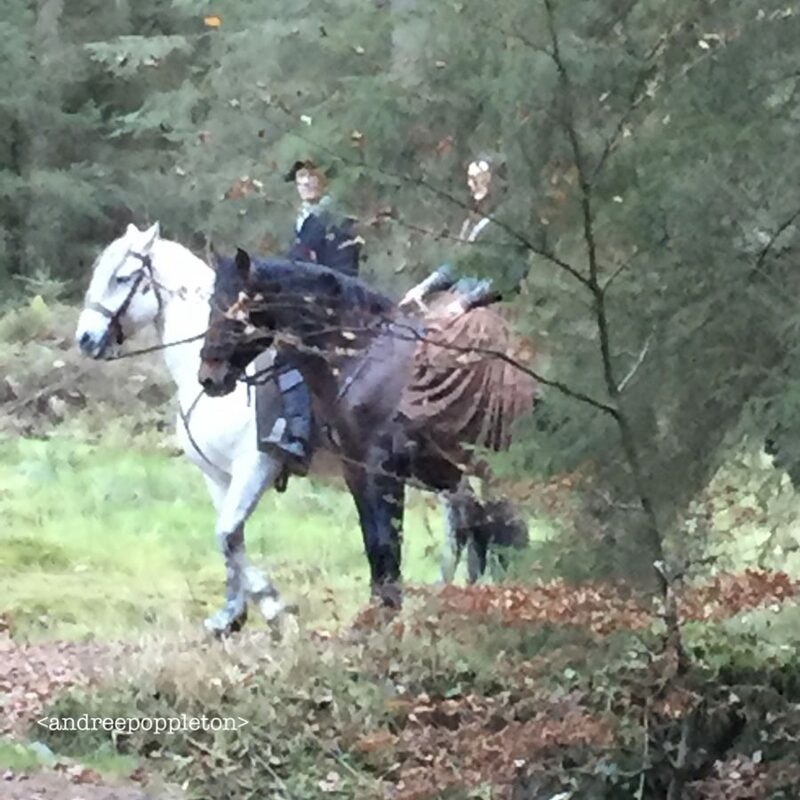 We’d heard on social media that there was some Outlander action around, in or near a village called Bridge of Earn. It’s a bit over an hour from Glasgow and for reasons I won’t go into here, we went by the most circuitous route possible and got lost a couple of times along the way! 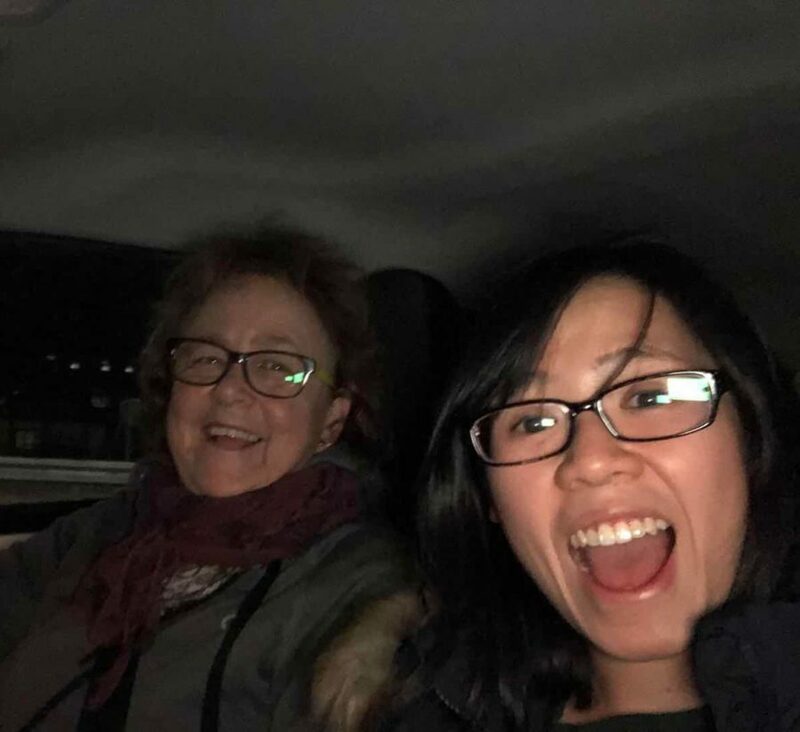 This was us reporting in on our antics to our newglasgowgirls pals while we made our way to the general area, Outlander music to keep us to the task at hand. Needless to say, it turned out to be a futile exercise. 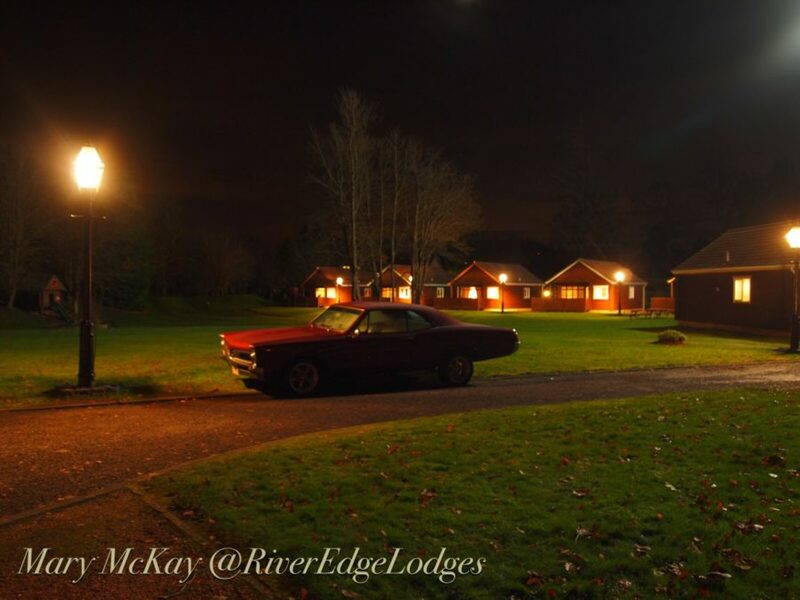 We found some fans in a car park who directed us to the River Edge Lodges but when we got there we were told by security that the whole thing had just wrapped up for the night. Another wild goose chase but we did have quite a bit of fun nevertheless. 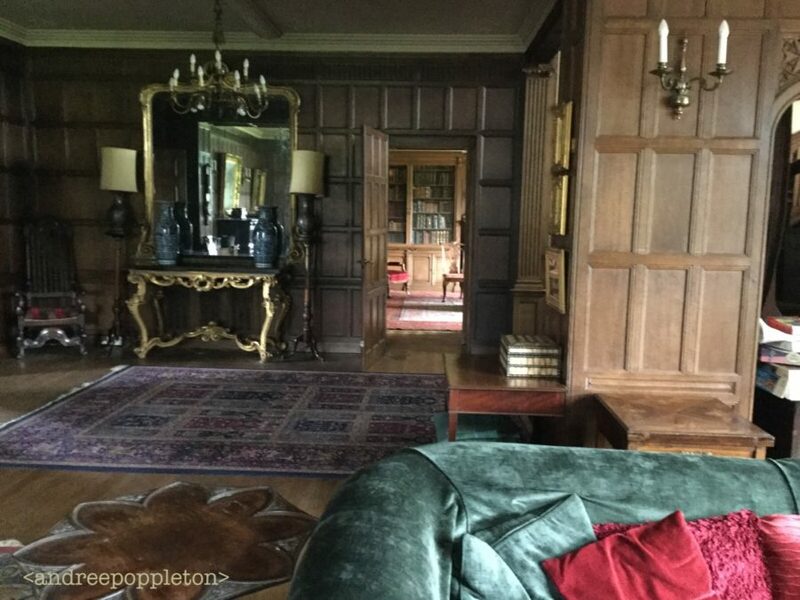 Mary’s Outlander adventure began in September 2017, when she received a phone call from a film location scouting team, who thought that her lodges may be suitable for their purposes. They asked if she’d heard of Outlander. Had she heard of it? 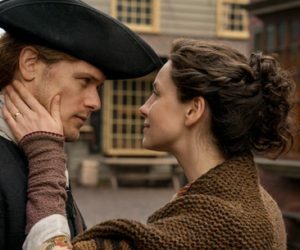 She had read ALL the books some years ago after her Dutch friends introduced her to Cross Stitch (known as Outlander in the U.S.) She always thought that the combination of the Scottish landscape and history would be perfect for the screen. 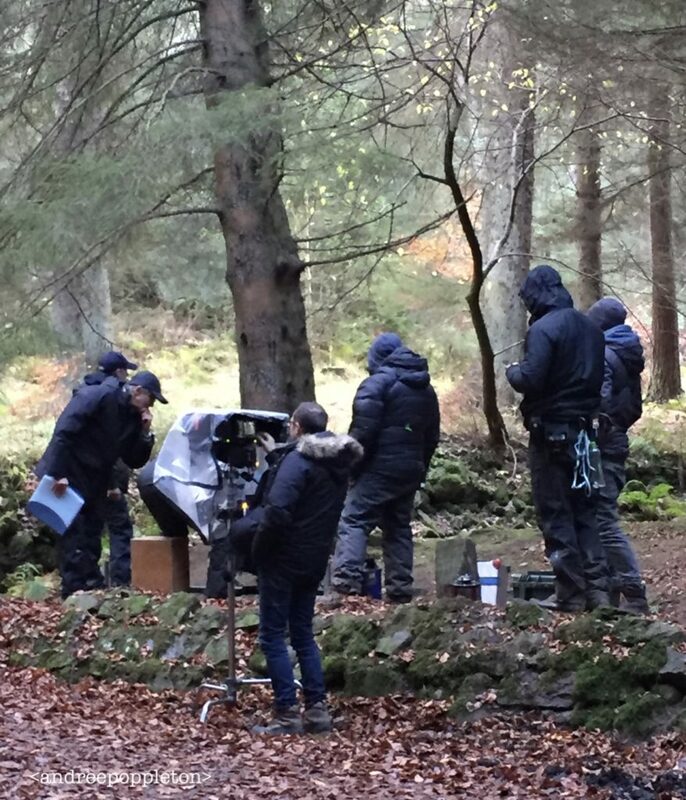 They had various meetings with the film location team, then one day about 20 people turned up in sleek black vehicles, wearing black puffa jackets and black shades. She says it was like a scene from Men in Black! 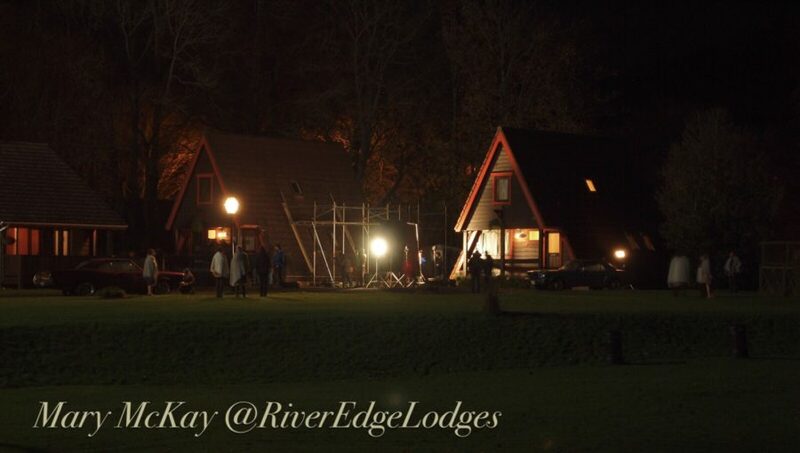 They spent ages looking inside and outside the lodges. Next they were presented with a document several pages long of what the team wanted to do to the lodges, inside and out. The attention to detail was impressive, including covering the kitchen units with period tiles and painting the walls, replacing curtains and blinds, covering up light switches etc etc. 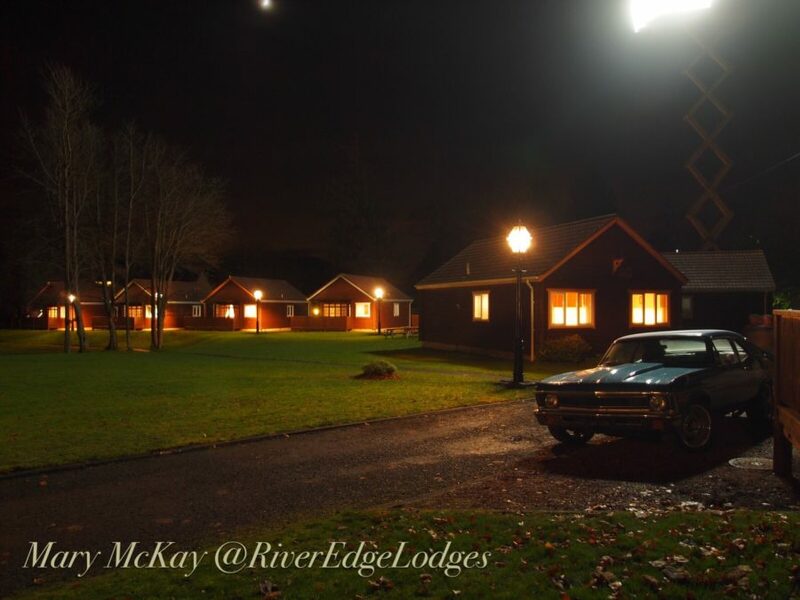 Two of the lodges were called the “Hero” lodges. One of these was used to film outside and was the Green Room for the actors. The other was used for filming inside. 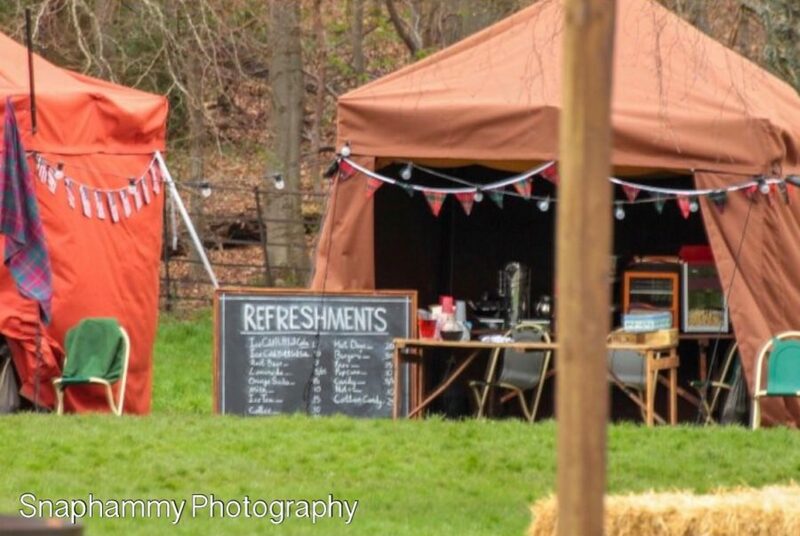 Other lodges in the park were used for some of the crew, catering and dressing. Outlander took over the whole park for the month of November and into December. The art department arrived first to do their thing. Then the company Propped Up arrived with vans with all the props. By this time 24-hour security monitored everyone coming into the park, to keep the set top secret. 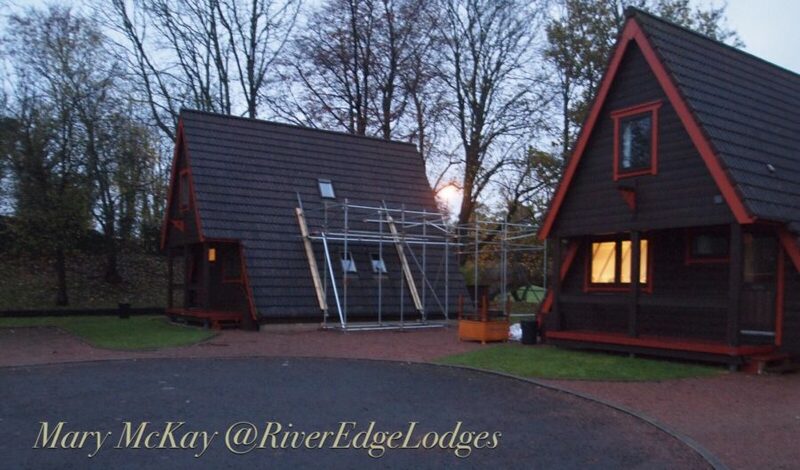 The team began painting the inside and outside of the lodges, taking the furniture out and in putting their furniture. The locations manager lived pretty much on-site in one of the lodges, overseeing everything. Mary’s husband, John, is a builder and he was involved in various jobs around the site. Again Mary was amazed at the attention to the tiniest detail; for example a certain type of outside light that was around in the 1960s was sourced and several of them brought in to dot around the park. On the day of filming, a huge truck arrived, bearing the mammoth light that was to be used to light the set. This was a 16-tonne scissor lift with a light on top. 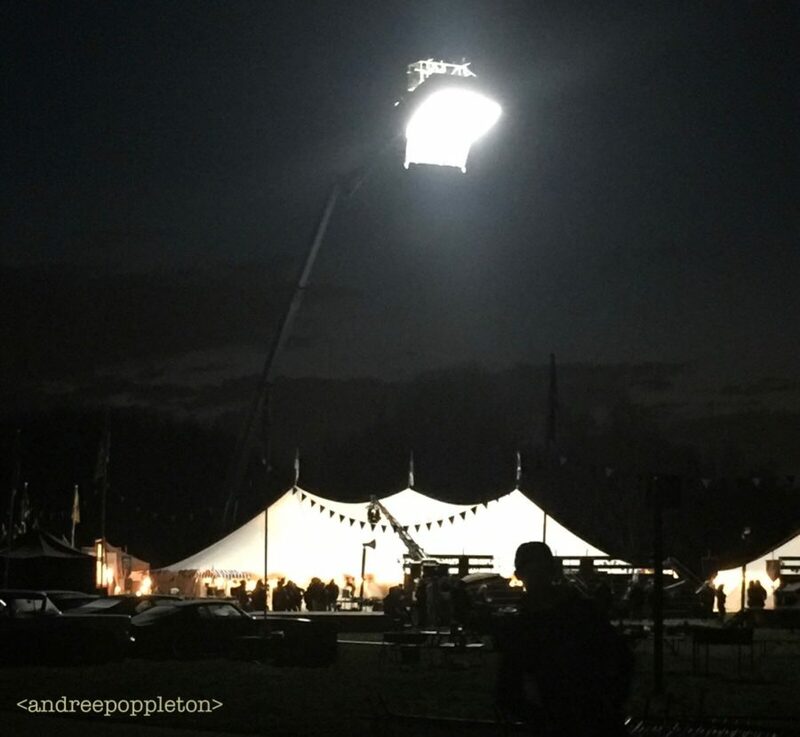 There was a large generator that had to be far enough away not to be heard when filming. 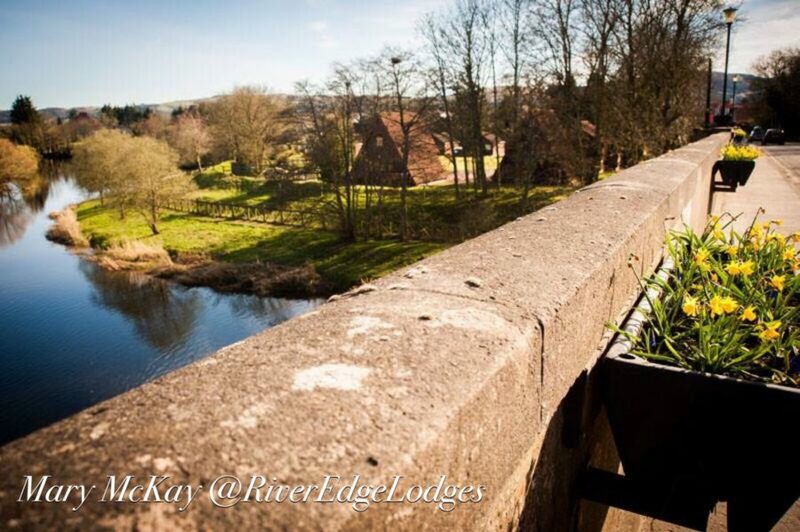 There was also an intervention with the road traffic passing over the bridge into the village. Traffic lights were set up on either side of the bridge so that the traffic could be stopped at intervals when shooting was taking place. Things all started to heat up as large numbers of other vehicles and film crew appeared. Mary’s daughter Alannah, was studying for exams and every so often she’d have to go out for a walk along the river to clear her head. One late afternoon when it was starting to get dark they wandered down their usual route by the river, which took them past the hero lodges and up to the bridge. As they wandered back home the security guy at the gates jumped out and asked them who they were and what was their business there. They explained that they lived here and he reluctantly let them past. She thought he was going to ask for a strip search! They managed to get through the huddle of media folk and made it back home unscathed. The unit manager, Tim, came up during a break and asked if Mary and Alannah would like to watch the filming when it re-started. Would they? Is the Pope Catholic? Tim guided them amongst all the vehicles and wires and cables and crew. They had to stop dead still after a signal from someone with a walkie-talkie. All traffic had stopped again and nobody moved a muscle until the signal to stand down again. Traffic moved and they were able to continue across the park towards the cameras. It was a cold night and everyone was well wrapped up. 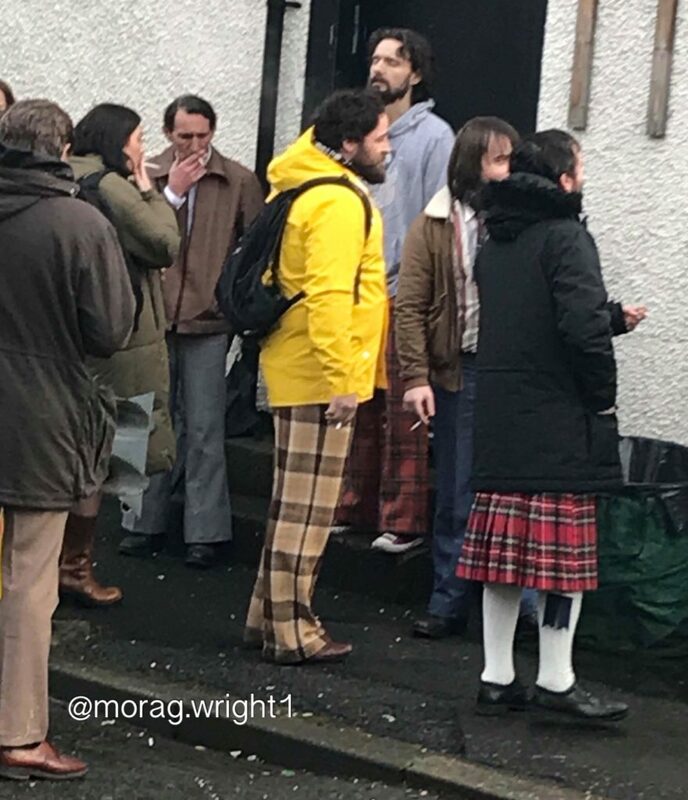 They walked past some of the actors who were waiting to be called. They were stamping their feet trying to keep warm. Mary figured these were probably extras waiting to be called. They waved and said hello and continued following Tim until they were right behind the cameras. They mingled with the crew and Tim showed them which camera to look into to see exactly what was being filmed. Then it was a call for silence again and the camera rolled. 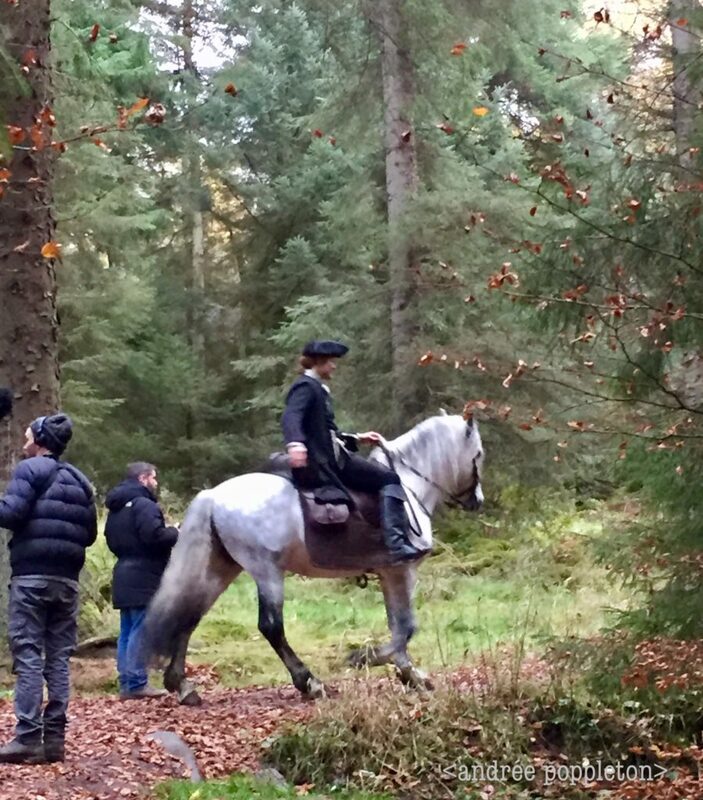 Who should come walking up towards the cameras, but Roger and Bree! Not extras as they had previously thought. They were so close that they could easily have reached out and touched them. They chatted a bit, gazing into each others eyes and then … they kissed. Mary and Alannah turned to each other in a silent Oh! They did this scene several times over, filming it from different angles, before moving on to the next bit. 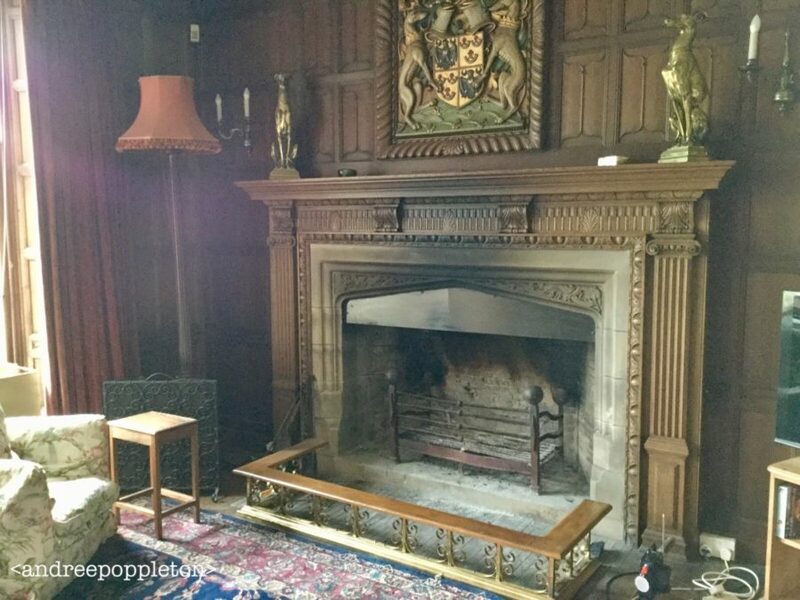 On the second day of filming, the scenes inside the lodge took place within a closed set. 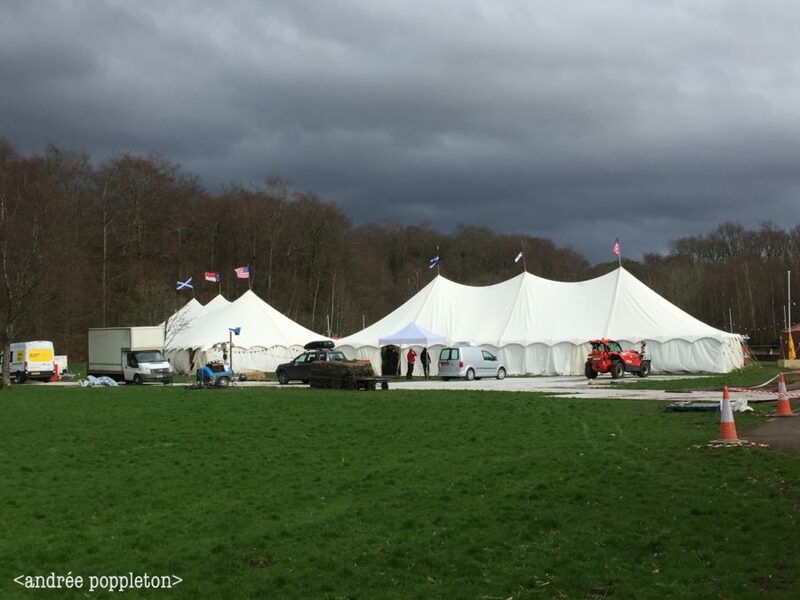 The whole lodge had a huge tent over it to simulate night time. The crew was minimal. 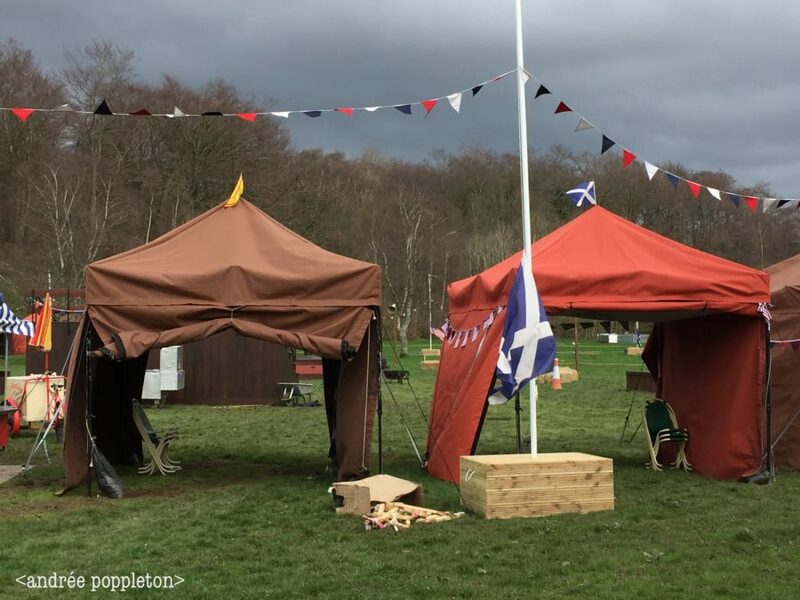 We’ve seen the scenes that went on that day, marvelled at Bree’s throwing skills and shed a few little tears for poor dear Roger, no doubt. 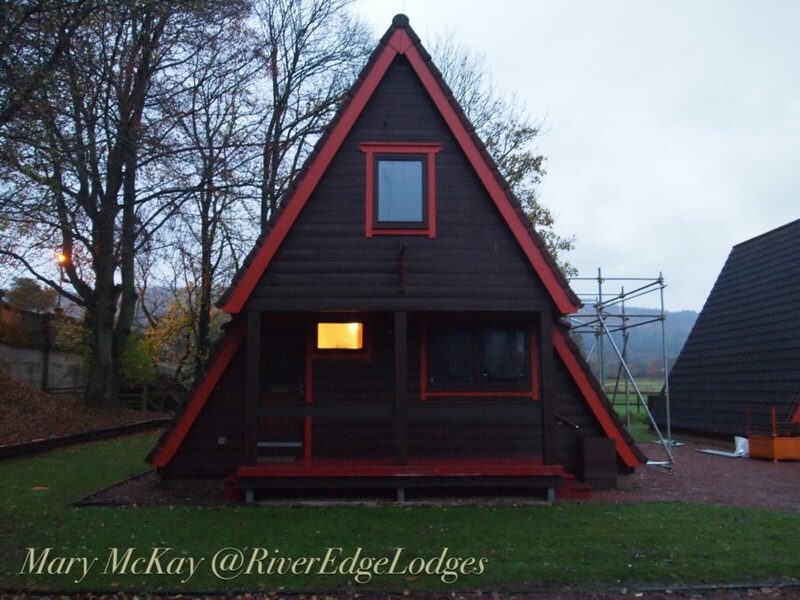 When it was all over it took another few weeks to restore the park and the lodges. And it all seemed to have been a dream. A dream that many other fans would love to have shared. 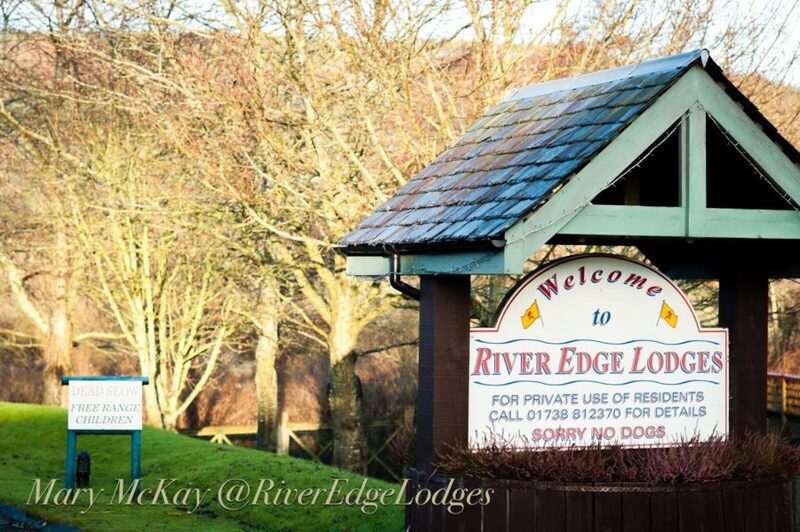 Maybe you can if you check in to the River Edge Lodges. 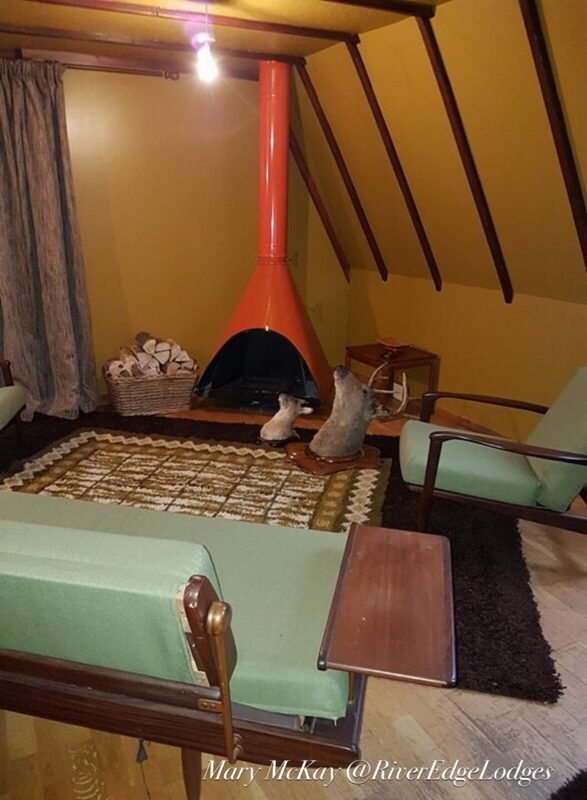 You might even stay in THAT lodge? Have you ever had a film crew in your house, street, neighbourhood? What was your experience? 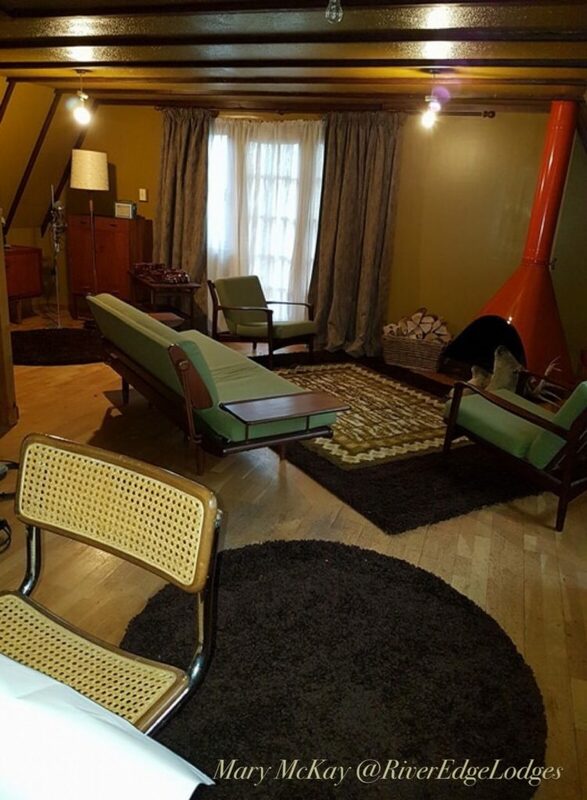 Have you ever stayed in a place that was used in a film or TV show? We are currently restoring a house built in 1835 in Columbia, Tennessee. 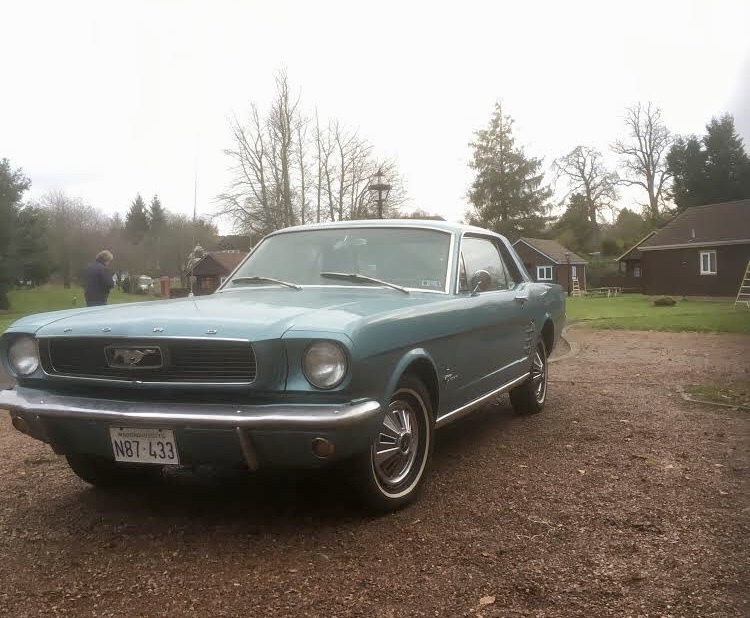 It has been used as a movie set twice in the past year and as a set for a country music video too (we are about 40 minutes south of Nashville). It is terrifying watching them move into your house. I made my husband stay with them the entire time to make sure they did not damage anything because I was just too nervous. 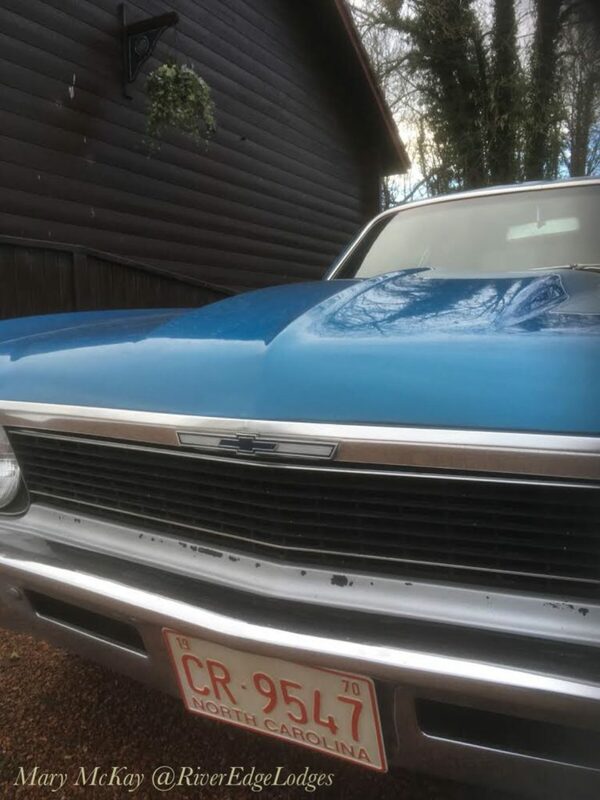 It worried me to death but their rental fees are helping pay for the massive restoration. 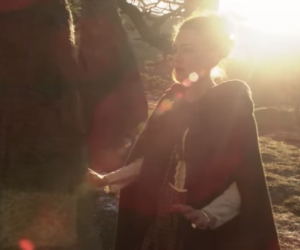 I visited Scotland a few years ago and saw loads of the spots used for Outlander. My experience really makes me appreciate the set design folks even more. They obviously treat these sights very respectfully. That sounds very stressful Angie, your place sounds amazing and it must surely cost a lot to restore. Can you tell us what movies to look out for your house in?? That would be fun. Glad you got to Scotland and to see Outlander locations too. Thanks for your comments. Loved all you shared. I was pained tho to see all those young men smoking outside the dance event. So many have given up this vice in the US – was a shock to see all the men smoking. We want our Scots healthy too. Hugs.